Figure 12.4. Characteristics of the summer 2003 heatwave (adapted from Schär et al., 2004). (a) JJA temperature anomaly with respect to 1961 to 1990. 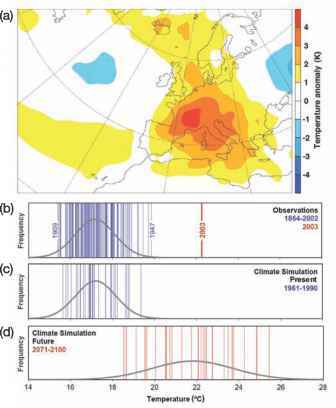 (b) to (d): JJA temperatures for Switzerland observed during 1864 to 2003 (b), simulated using a regional climate model for the period 1961 to 1990 (c) and simulated for 2071 to 2100 under the A2 scenario using boundary data from the HadAM3H GCM (d). In panels (b) to (d): the black line shows the theoretical frequency distribution of mean summer temperature for the time-period considered, and the vertical blue and red bars show the mean summer temperature for individual years. Reprinted by permission from Macmillan Publishers Ltd. [Nature] (Schär et al., 2004), copyright 2004.
reduced agricultural production and increased production costs, generating estimated damages of more than €13 billion (Fink et al., 2004; see also Chapter 5 Box 5.1). The hot and dry conditions led to many very large wildfires, in particular in Portugal (390,000 ha: Fink et al., 2004; see also Chapter 4 Box 4.1). Many major rivers (e.g., the Po, Rhine, Loire and Danube) were at record low levels, resulting in disruption of inland navigation, irrigation and power-plant cooling (Beniston and Díaz, 2004; Zebisch et al., 2005; see also Chapter 7 Box 7.1). The extreme glacier melt in the Alps prevented even lower river flows in the Danube and Rhine (Fink et al., 2004). The excess deaths due to the extreme high temperatures during the period June to August may amount to 35,000 (Kosatsky, 2005), elderly people were among those most affected (WHO, 2003; Kovats and Jendritzky, 2006; see also Chapter 8 Box 8.1). The heatwave in 2003 has led to the development of heat health-watch warning systems in several European countries including France (Pascal et al., 2006), Spain (Simón et al., 2005), Portugal (Nogueira, 2005), Italy (Michelozzi et al., 2005), the UK (NHS, 2006) and Hungary (Kosatsky and Menne, 2005). 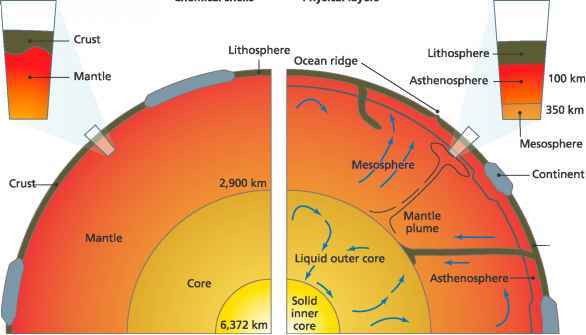 Earlier studies of the possible impacts of rapid change in Meridional Overturning Circulation (MOC), also known as the thermohaline circulation (THC), in the North Atlantic are now being updated (Vellinga and Wood 2002, 2006; Alley et al., 2003; Jacob et al., 2005; Rahmstorf and Ziekfeld, 2005; Stouffer et al., 2006; Schlesinger et al., 2007). Model simulations of an abrupt shut-down of the Atlantic MOC indicate that this is unlikely to occur before 2100 and that the impacts on European temperatures of any slowing in circulation before then are likely to be offset by the immediate effects of positive radiative forcings under increasing greenhouse gases (Arnell et al., 2005; Gregory et al., 2005; Vellinga and Wood, 2006; Meehl et al., 2007). Under slowing or full Atlantic MOC shut-down, temperatures on Europe's western margin would be most affected, together with further rises in relative sea level on European coasts (Vellinga and Wood, 2002,2006; Jacob et al., 2005; Levermann et al., 2005; Wood et al., 2006; Meehl et al., 2007). Although there are no indications of an imminent change in the North Atlantic THC (Dickson et al., 2003; Curry and Mauritzen, 2005) it is recognised that MOC shut-down, should it occur, is likely to have potential socio-economic impacts for Europe and more widely (Table 12.3). Hence, it would be valuable to consider these impacts in developing climate policy (Defra, 2004c; Keller et al., 2004; Arnell et al., 2005; Schneider et al., 2007). Such policies are currently difficult to quantify (Manning et al., 2004; Parry, 2004). Assessment of the likely impacts of an abrupt Atlantic MOC shut-down on different economic and social sectors in Europe has been made using integrated assessment models, e.g., FUND (Tol, 2002, 2006; Link and Tol, 2004). Results suggest that the repercussions for socioeconomic factors are likely to be less severe than was previously thought.